My dishwasher smells like rotten eggs/fish. My dishwasher is 5 years old and runs perfectly besides the smell. I have tried dishwasher cleaner and the sewer smell has not been removed. It smells worse when the dishwasher is running compared to after a wash cycle. Can you list ways to remove bad odors from a dishwasher? 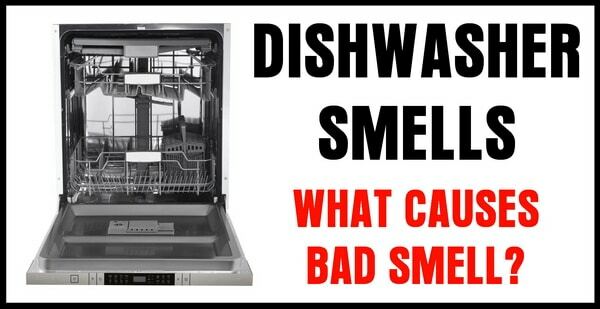 Dishwasher Smells – What Causes Bad Smell: The sewer, egg, or fish smell in your dishwasher is most likely caused by food particles stuck in the dishwasher filter or the drain hose is bent or the drain hose is positioned wrong. See below for all of the reasons that can cause these horrible smells and odors. How to remove odors and smells from a dishwasher? The dishwasher filter/trap has accumulated food particles that are causing the smell. Remove the filter and clean away any food particles that may be present. Dishwasher drain hose is kinked/bent causing waste water to flow back into dishwasher. Straighten the drain hose to prevent the backflow of wastewater. Dishwasher drain hose is too low causing the water to flow back into the bottom of the dishwasher. Elevate and loop the drain hose so the water is not able to flow back into the bottom of the dishwasher. Air gap is clogged/blocked and preventing the waste water to be pumped out of dishwasher. Check the air gap to be sure there is no blockage that prevents water from flowing through. Mold/bacteria can grow in the dishwasher if the machine is not run regularly. Keeping the dishwasher door cracked open slightly when not in use will allow all moisture to dry. Food has been dropped or a small animal may have crawled under the dishwasher. Remove dishwasher from under the cabinet (remove screws) and inspect underneath the dishwasher. The videos below show more detail on the above items such as a dishwasher filter, dishwasher drain hose, and a dishwasher air gap. Once you find the cause of the bad smell in your dishwasher, use white distilled vinegar or baking soda to clean the interior of the dishwasher. Use a cup of white vinegar on the top rack and run a full cycle. Need help? Have questions about how to remove smells from a dishwasher? Please leave a comment or question below and let us know the details of your issue with your dishwasher. Let us know the model number and brand (ex. Bosch, GE, LG, Samsung, Whirlpool) of the dishwasher for us to assist further. Next post: AC Not Blowing Cold – How To Get Air Conditioner To Blow Cool Air?